Christie, Booker and Democratic party bosses, along with the charter school movement, suffer a huge defeat. If Bill de Blasio needs a partner in rebuilding America’s urban core, he can now look west, just across the Hudson River, to Newark, where Ras Baraka was elected mayor yesterday. Baraka’s election means a lot to progressives, organized labor, teachers and others in Newark, New Jersey’s largest city—and it is a significant defeat for Governor Chris Christie and his allies in the Democratic party, including former Newark Mayor Corey Booker and the Democratic party bosses George Norcross and Joe DiVincenzo. It might also represent a key tipping point for the next New Jersey race for governor, which—if Christie resigns in the scandal that is plaguing him or, alternately, if and when he resigns to run for president—could happen as early as 2015. The two men have both looked to New York City for money, but their donor bases are different. Independent expenditure groups have poured money into the local race, with two groups spending more than $600,000 on network and cable television ads, according to a person familiar with the spending. Mr. Jeffries has been backed by a number of New York financiers—much as Mr. Booker was—along with lawyers and education leaders. Mr. Baraka has the support of artists such as Spike Lee and Ms. Hill and professors such as Princeton University’s Cornel West, along with prominent alumni from his Howard University days. One super PAC, Newark First, has raised more than $1.3 million to support Mr. Jeffries, according to its filing. Contributors included several financial executives and Education Reform Now, a New York City-based group begun by financial fund managers who support charter schools. But the largest contribution to the pro-Jeffries Newark First group came from another group, Education Reform Now, who donated $850,000. On the group’s website, Education Reform Now defines itself as an organization in which “policy objectives are built around strengthening innovation, public charter laws, accountability, high-quality new school development, transparency on finance and student results, and best practices for turning around low-performing schools.” Members of the group, including board members who have experience working at high-powered Wall Street hedge funds, are active in the Success Academies network of charter schools. 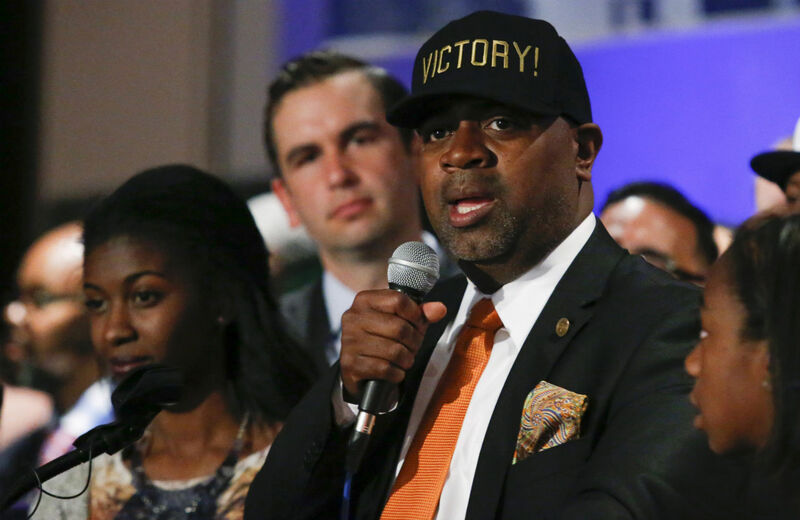 Ras Baraka, a high school principal and the son of a poet, yesterday easily defeated a Wall Street-backed promoter of school privatization to become the next mayor of Newark. Baraka’s victory repudiated the policies not just of his rival, Shavar Jeffries, but those of Gov. Chris Christie, former Mayor Cory Booker, and state-appointed superintendent Cami Anderson who is trying to close neighborhood public schools and replace them with privately run charter schools. It’s no surprise. Moran has used the state’s largest paper to cheerlead for the dissolution of local schools to make way for the shiny penny of corporate charter schools and the tycoons that come with it, and the PR firms that sell it, who see dollar signs where they should see kids, and fertile ground where they should see communities. So, no surprise—it’s just Moran backing Christie again, backing the mayoral candidate who’ll let Cami keep running amok, backing the guy whose campaign is funded by investors who expect Shavar Jeffries to help Cami Anderson to help Chris Christie keep their investment opportunities hot for them. In bucking the Essex Democratic Party establishment, Fulop by extension threw the equivalent of a political hand grenade into the laps of those same establishment brand names who showed up uncomfortably at a handful of Barbara Buono for Governor events last year while madly disparaging her campaign in text and cellphone as hopeless. By breaking from the stage he had stood on with Sweeney and DiVincenzo and supporting Baraka, Fulop realigned his own template from a year ago, when he wavered his toe at the edge of the gubernatorial contest, never uttering Buono’s name while torturously finally deciding on the safely impersonal sound-bite of supporting the Democratic ticket in the general election. The Baraka victory also was a repudiation of Essex County Executive Joseph DiVincenzo, who backed Jeffries. DiVincenzo, who once entertained fantasies of becoming governor himself, proved to be a weak organizer in the race. He betrayed Democratic gubernatorial [candidate] Barbara Buono last year to back Gov. Chris Christie, a Republican. Baraka said Jeffries met several times with George Norcross, the South Jersey Democratic power broker and part owner of the Philadelphia Inquirer, who Baraka said helped establish Newark First. The media and mail consultants to Newark First, he said, are extensively involved with Norcross candidates. Staying out of the race, officially at least, was former Newark Mayor Corey Booker, now a US senator, who was the darling of the charter school movement and a quiet ally of Christie’s. Baraka’s win is a repudiation of Booker’s era, when Newark lost control of its own school system to the state government and to Christie.